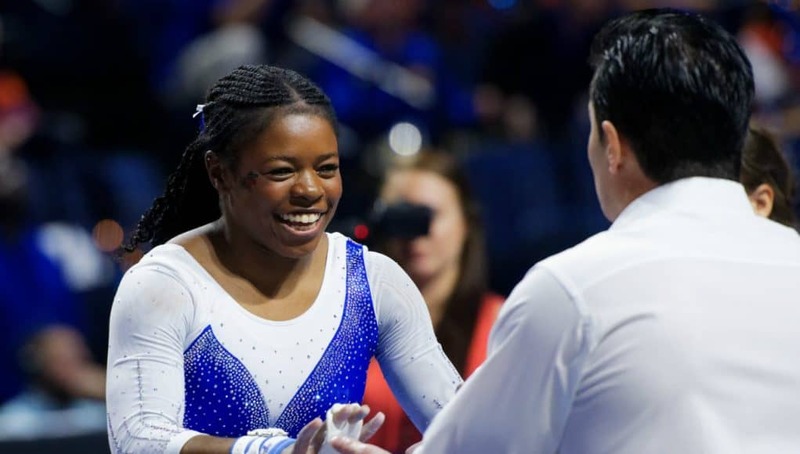 GAINESVILLE, Fla. – In Friday’s meeting of the Southeastern Conference unbeaten gymnastics teams, it was No. 2 Florida retaining that title with a 197.85 – 196.70 win over No. 12 Auburn Friday evening at Exactech Arena at the Stephen C. O’Connell Center. Florida’s 197.85 stands as the nation’s No. 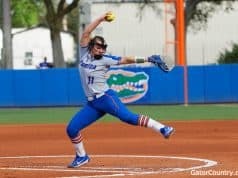 6 total of the season and is UF’s second-highest for 2019. Auburn’s 196.70 is just off its season-best of 196.775 set Jan. 25 in its win over Georgia. 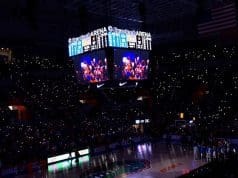 Tonight’s Exactech Arena crowd of 9,055 for the 13th Annual Gators Link to Pink is Florida’s season-high and ranks as the ninth largest in program history. Florida opened the meet with a season-best 49.35 on vault, but trailed the Tigers by 0.025 heading into the second rotation. Senior Alicia Boren won the evening’s vault title with a Gator season-best 9.925. Freshmen Savannah Schoenherr and Trinity Thomas shared second with Auburn’s Derrian Gobourne at 9.90. That deficit was quickly closed on the second rotation, as Florida pushed out a 0.475 lead at the meet’s midway point. Thomas claimed her third bars title of the season at 9.95. Junior Amelia Hundley shared second with Auburn’s Abby Milliet at 9.90. A six-for-six Gator beam set was led by a winning 9.9 from a trio of Gators – Boren, Rachel Gowey and Alyssa Baumann. Florida finished the meet with a season-best 49.65 on floor exercise. Thomas won the title with her collegiate-best of 9.975. Boren took second at 9.95 while Baumann and freshman Nya Reed shared third with Auburn’s Milliet at 9.925. Thomas equaled her collegiate-best to take her second all-around title (39.70). Boren’s runner-up total of 39.625 is her season best. Auburn freshman Derrian Gobourne took third a 39.45. * Florida’s 49.65 raises its season-best for floor exercise, as UF posted a 49.60 at Oklahoma last Friday. * Thomas equaled her collegiate-best all-around of 39.70 to take her second title. That total shares third among the nation’s all-arounders this season and is the highest among the nation’s freshmen. * In addition to Thomas’ all-around, two other Gator season-bests were posted Friday – Boren (9.925 – vault) and Thomas (9.975 – floor). * Thomas takes her third bars title of season. Each of her 2019 bars marks are 9.925 or better. * Thomas now has three nearly perfect 9.975 marks (two on bars, one on floor). Three equals the season high by a Gator freshman set by Bridget Sloan (2013). * Crowd of 9,055 is No. 9 in Florida history and UF’s season-high. The Gators Link to Pink meet continues to be popular, as the meet has drawn the program’s No. 6 (9,198), No. 7 (9,197), No. 8 (9,108) and No. 9 crowds. 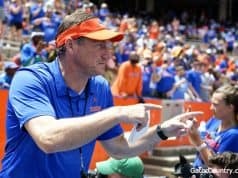 RECORDS: Florida (4-1, 4-0 SEC), Auburn (5-1, 4-1 SEC). THE SERIES: Florida leads the series 77-11. Tonight was the 13th Annual Gators Link to Pink meet. These meets are part of a Southeastern Conference initiative and most of the league’s teams will participate in a “pink” meet this season. Team colors are set aside as the teams wear pink to show their support for the breast cancer fight. Florida – Florida is No. 2 in the Road to Nationals standings<https://urldefense.proofpoint.com/v2/url?u=https-3A__roadtonationals.com_results_standings_season_2019_5_0_5&d=DwIFJg&c=pZJPUDQ3SB9JplYbifm4nt2lEVG5pWx2KikqINpWlZM&r=6MG06PG_fwpe7ULfewi6NrFR2j_4ngNZtgGHhDCeRY0&m=DWtuR0p-fP7oUC3oSOpVBvscLlVMgkQddKbHtNCk91Y&s=BugtxrDV5ryTPmeTzvzZJGDdSVQzJ6lDCqX-IktS2P0&e=>. AU – The Tigers are No. 12 in the Road to Nationals standings<https://urldefense.proofpoint.com/v2/url?u=https-3A__roadtonationals.com_results_standings_season_2019_5_0_5&d=DwIFJg&c=pZJPUDQ3SB9JplYbifm4nt2lEVG5pWx2KikqINpWlZM&r=6MG06PG_fwpe7ULfewi6NrFR2j_4ngNZtgGHhDCeRY0&m=DWtuR0p-fP7oUC3oSOpVBvscLlVMgkQddKbHtNCk91Y&s=BugtxrDV5ryTPmeTzvzZJGDdSVQzJ6lDCqX-IktS2P0&e=>. It’s Florida’s third top-10 match-up of the season when they compete at No. 8 Alabama on Friday, Feb. 15. The Tide won 196.70-195.80 at Arkansas tonight to push its record to 8-2 and 3-2 SEC.